Washing your car can be a tedious and time-consuming task. Pressure washers help cut the cleaning time in half. Pressure washers are machines that use high-pressure water spray to remove dirt and grime from surfaces and objects like buildings and cars. Their cleaning power is measured in pressure, pounds per square inch (psi), and the rate of water flow measured in gallons per minute (gpm). High and low-rated machines can perform the same cleaning job — only at varying speeds. Gas-Powered Pressure Washer: A gas pressure washer can clean things faster due to their high pressure and flow rates. Additionally, they do not require an outlet for a power source, but run off of fuel instead, and tend to be on the heavy side. Electric-Powered Pressure Washer: Electric pressure washers tend to be smaller than gas ones and operate at lower pressures and flow rates. They still get the job done, and start-up and stop without hassle. For cleaning vehicles, electric pressure washers are often the best choice. They typically max out at 2000 psi, a pressure low enough to not damage car paint. When it comes to cleaning your car, our list features the most-convenient and high-quality pressure washers. Anyone of them will keep your car looking shiny and new, and save you time compared to traditional car washing methods. The Sun Joe SPX 3000 is the #1 best-selling pressure washer on Amazon and in the United State. It features brass fittings to make it extremely durable. The pump incorporates Total Stop System technology in the form of a trigger that automatically shuts down the pump when not in use, allowing it to provide between 300 and 500 hours of washing. 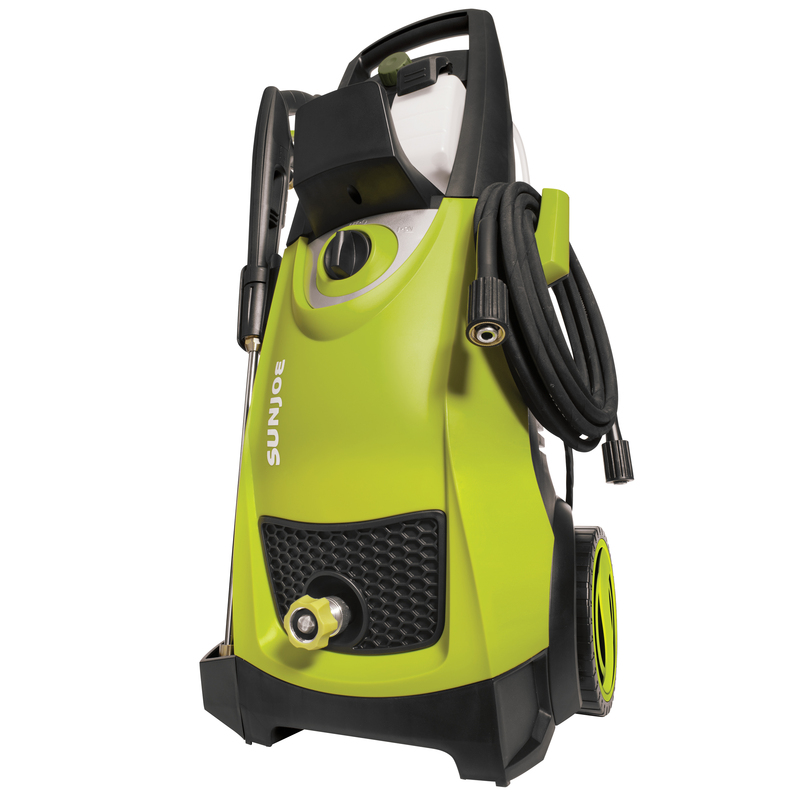 Lightweight, portable, and featuring two detergent tanks for different cleaning tasks, this electric pressure washer is convenient and easy to use with five quick-connect spray tips to change the spray. When using the Sun Joe Foam Cannon with car-specific washing soap, your car will receive a thorough wash that provides an excellent shine. The Kärcher K5 Premium boasts of lasting five times longer than its competitors. A water cooling feature decreases the temperature of the motor to increase its overall longevity. The Kärcher’s high-quality build includes technology to make it maintenance-free and resistant to corrosion, giving users a pressure washer that is easy to use for many washes. With the DirtBlaster and Vario spray types, it can be used for a variety of cleanings in addition to giving your car an excellent shine. A Right Angle wand add-on accessory also allows for cleaning hard-to-reach places, like car underbellies and wheel curves. Though less popular than other common pressure washers, the Annovi Reverberi Blue Clean AR383 will blast away your car’s dirt and grime in minutes. Its lightweight design combined with high water pressure power makes it a convenient and worthwhile purchase. A 30 inch-long power cord makes spraying down your car as safe as possible, as well as an automatic shutdown feature to conserve the washer lifespan. The AR Blue Clean AR383 also comes with two wands: the adjustable spray wand and turbo wand. Depending on what section of your car you’re cleaning, you can switch out wands for more thoroughness. 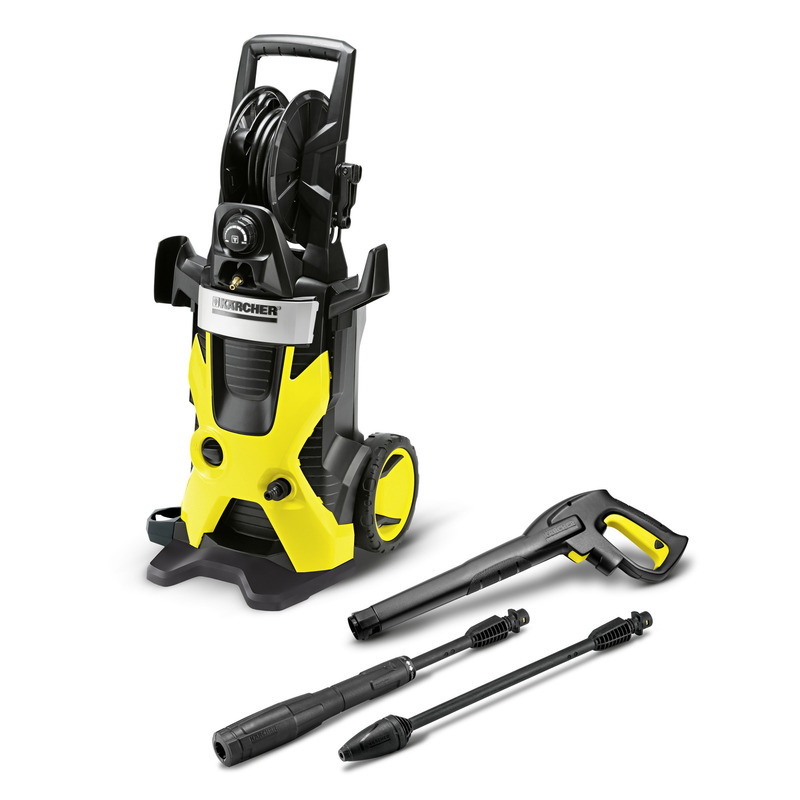 Instead of switching wands when changing up cleaning technique, the Ivation Electric Pressure Washer comes with a fully adjustable spray wand. It comes with five different nozzle attachments in an easy-to-setup design. A Bonus Turbo Spray Wand allows for ideal maneuverability for getting spots under the car at a safe pressure. Plus, purchases come with a one year warranty should your washer wear out before its time. The powerful pump of the Greenworks GPW1950r makes up for its relatively low-energy motor. It’s easy to put together, transport, store, and use due to its lightweight design. It even features quick-connect nozzles to change up the water spray for versatile cleaning, as well as a low-pressure foam sprayer. 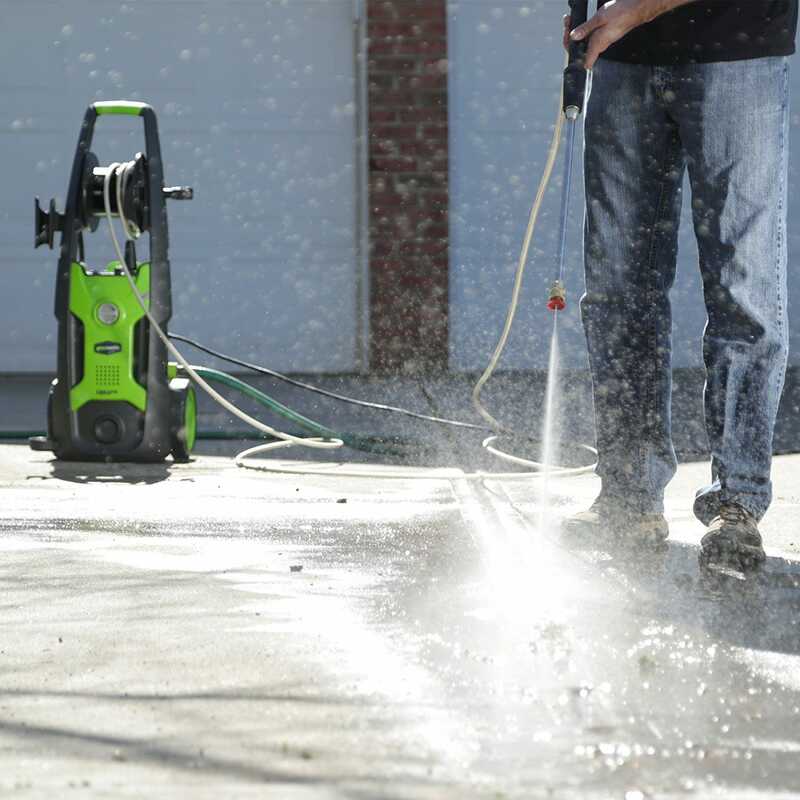 The Greenworks GPW1950 provides an ideal, vertical car wash. Its built-in soap-tank and hose reel make washing your car quick and easy with fewer trips to and from a bucket. 1. Car Cleaning Efficiency: Due to the combined speed and pressure of pressure washers, car cleaning time can be practically cut in half. Instead of methodically using buckets and a garden hose, a pressure washer can blast away dirt fast. 2. Thorough Cleaning: Pressure washers allow you to clean all the corners and crannies of your car’s exterior — even taking on mud built-up behind wheels and stubborn grime. The different spray nozzles allow for multiple streams of water that let you reach the tougher spots of your car you could not otherwise access. 3. Saves You Money: Pressure washers end up using less water than the bucket and hose method, helping you lessen that water bill. Additionally, many pressure washers include built-in cleaning soap to save you the cost of purchasing car soap. Q: When turning the temp. selector from cold all the way to hot, does it click?